The information contained in this site is intended for U.S. healthcare professionals. By clicking “Yes” below, you certify that you are a licensed healthcare professional. *10 of the 12 largest national plans cover MAVYRET as of November 2018. Information subject to change. Cost shouldn't get in the way of getting treated. MAVYRET Patient Support is ready and waiting to help you understand your coverage and what financial resources might be available to you. Call 1-877-628-9738 to learn more. DON'T FACE HEP C ALONE. †Terms and Conditions apply. This benefit covers MAVYRET® (glecaprevir and pibrentasvir). Eligibility: Available to patients with commercial prescription insurance coverage for MAVYRET who meet eligibility criteria. Copay assistance program is not available to patients receiving prescription reimbursement under any federal, state, or government-funded insurance programs (for example, Medicare [including Part D], Medicare Advantage, Medigap, Medicaid, TRICARE, Department of Defense, or Veterans Affairs programs) or where prohibited by law or by the patient’s health insurance provider. If at any time a patient begins receiving prescription drug coverage under any such federal, state, or government-funded healthcare program, patient will no longer be able to use the MAVYRET copay card and patient must call MAVYRET Patient Support at 1-877-628-9738 and stop use of the copay card. Patients residing in or receiving treatment in certain states may not be eligible. Patients may not seek reimbursement for value received from MAVYRET Patient Support including the copay card from any third-party payers. Offer subject to change or discontinuance without notice. Restrictions, including monthly maximums, may apply. This is not health insurance. 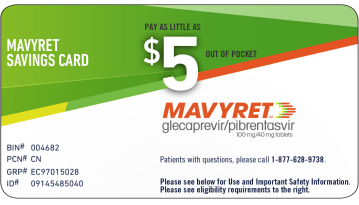 MAVYRET™ (glecaprevir and pibrentasvir) tablets are a prescription medicine used to treat adults with chronic (lasting a long time) hepatitis C virus (hep C) genotypes 1, 2, 3, 4, 5, or 6 infection without cirrhosis or with compensated cirrhosis. What is the most important information I should know about MAVYRET? Hepatitis B virus reactivation: Before starting treatment with MAVYRET, your doctor will do blood tests to check for hepatitis B virus infection. If you have ever had hepatitis B virus infection, the hepatitis B virus could become active again during or after treatment for hepatitis C virus with MAVYRET. Hepatitis B virus that becomes active again (called reactivation) may cause serious liver problems including liver failure and death. Your doctor will monitor you if you are at risk for hepatitis B virus reactivation during treatment and after you stop taking MAVYRET. What should I tell my doctor before taking MAVYRET? If you have had hepatitis B virus infection, have liver problems other than hep C infection, have HIV-1 infection, have had a liver or a kidney transplant, or any other medical conditions. If you are pregnant or plan to become pregnant, or if you are breastfeeding or plan to breastfeed. It is not known if MAVYRET will harm your unborn baby or pass into your breast milk. Talk to your doctor about the best way to feed your baby if you take MAVYRET. About all the medicines you take, including prescription and over-the-counter medicines, vitamins, and herbal supplements. MAVYRET and other medicines may affect each other. This can cause you to have too much or not enough MAVYRET or other medicines in your body. This may affect the way MAVYRET or your other medicines work, or may cause side effects. Do not start taking a new medicine without telling your doctor. Your doctor can tell you if it is safe to take MAVYRET with other medicines. What are the common side effects of MAVYRET? The most common side effects of MAVYRET are headache and tiredness. These are not all of the possible side effects of MAVYRET. Tell your doctor if you have any side effect that bothers you or that does not go away. This is the most important information to know about MAVYRET. For more information, talk to your doctor or healthcare provider. Please see full Prescribing Information, including the Patient Information. Conversely, the presence of this link does not imply the linked site’s endorsement of MAVYRET.com or AbbVie. You are about to enter a site that is for U.S. Healthcare Professionals Only. By selecting “Yes” below, you certify that you are a Healthcare Professional and that you wish to proceed to the Healthcare Professionals Only section on the AbbVie Medical Information site. Products or treatments described on this site are available in the U.S., but may not be available in all other countries. I am a licensed Healthcare Professional and wish to proceed to the Healthcare Professionals Only AbbVie Medical Information site. If you have any questions about this AbbVie Inc. website that have not been answered, contact us. Tap for Important Safety Information about MAVYRET including Important Warning on Hepatitis B reactivation.